The best golf lessons teach strong repeatable mechanics and sensible golf course management. My golf lessons are simple. I promote sound grip, athletic posture, correct ball position and good alignment. I help you learn to be your own coach by teaching cause and effect relationships within your golf swing. When your golf fundamentals are consistent and you’ve mastered a repeatable swing, the next golf lesson is golf course management. Knowing whether to hit a long shot or just get back to the fairway can make all the difference in enjoying the game. I offer golf lessons to a wide variety of people from first-time-golfers, to those trying to break 90 and golfers wishing to cut their handicap in half. Golf instruction begins with a student interview and evaluation, discussing goals and objectives. Sessions are tailored to the individual’s needs. The golf swing is a series of cause and effect relationships. We can only superficially address one issue that might be causing an undesirable outcome in a single golf lesson. In a series we can dig into the root of the issue and focus on real improvement. Students have their golf swing analyzed using the V1 Professional Coaching System, the most advanced video golf instruction device on the market. Before and after footage of your golf swing is compared to PGA TOUR players. The lesson is available to view online for review. 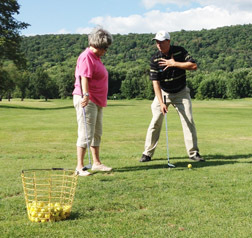 For beginner to intermediate golfers, group golf lessons are an economical way to get instruction and fun to do with a group of friends, your spouse or family. Sessions are tailored to be most effective where groups have a similar skill level. Call for large group clinic pricing, 7 students and up. Clinics are held in inclement weather excluding heavy rain or lightning. Difficulty finding time? We can come to you in the greater Binghamton, NY area. Have a lesson in your own backyard using a net. Perfect for beginners who may not be comfortable at the driving range. Available for individuals and small groups. Contact John Rose to schedule a lesson today.